5 days after getting back from our last trip I’m itching to get out again. Someone suggested Sumner’s Pond near Horsham. Booked 10am, packed 11am, arrived 12pm. 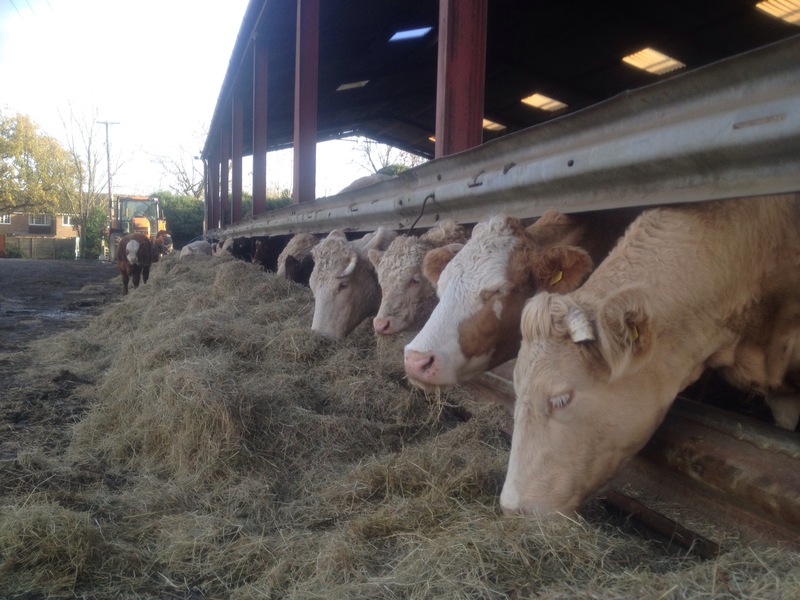 On arriving at the site we were greeted by the most beautiful herd of cows and calfs all snuggled up for winter casually grazing on bales of hay. 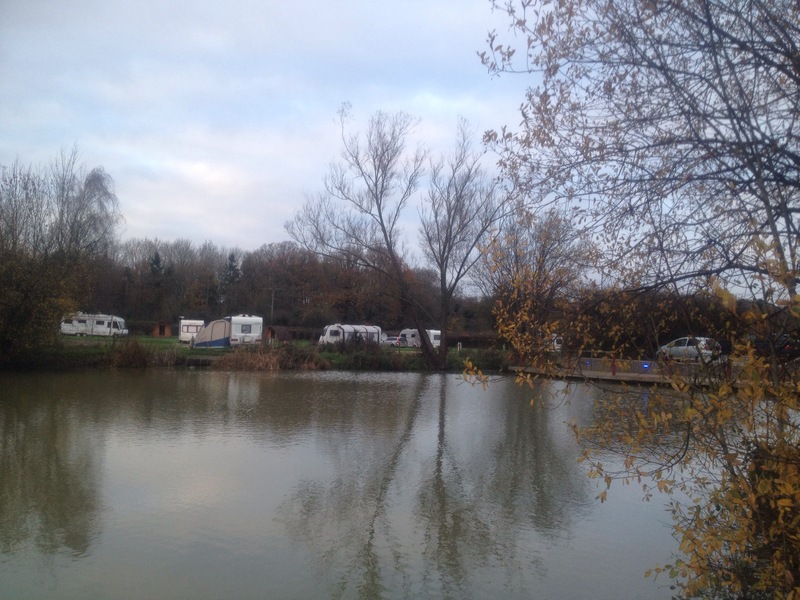 Sumner’s Pond is a campsite and fishery about an hour away from London close to the South Downs and about half an hour north of Brighton. Split into 3 seperate camping areas, we were allocated a pitch in Ribbon Park. A mixture of very soggy grass pitches and hard standing. Our hard standing pitch fronted onto 4 timber camping pods. With lakes close by to all 3 sites for fishing, this brought wildlife in the form of ducks, geese and herons. There is a cafe bar on the waters edge that opens quite late into the evening. Loads of lovely little wooded walks, perfect for dog owners. We had opted for a standard pitch at £13 for the pitch with a £4.50 per adult charge. You can upgrade to a lakeside pitch which is £20, for that special occasion would be lovely. Our pitch could have been better if we had been sited in one of the other areas. With it being out of season there was quite a bit of work going on with heavy diggers and tractors moving around all day. 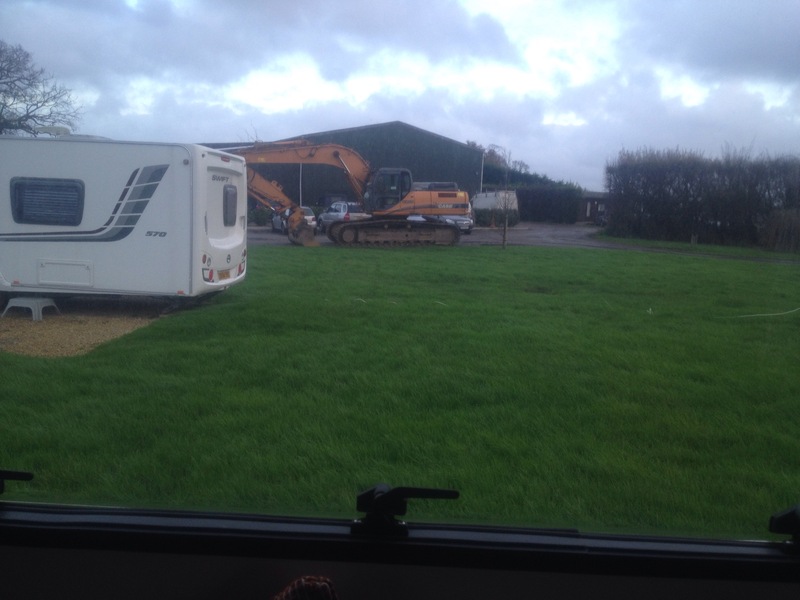 We had the biggest mechanical digger parked up not far behind our ‘van. Shame really that it couldn’t have been located somewhere else out of view given the size of the site. The pitches although very long aren’t very wide, only really wide enough for a caravan and either an awning or a car. Not sure where you would park if you put an awning up. After lunch we set about exploring the site. The ground was very boggy after a lot of rain over the last few weeks, the paths were relatively ok for walking boots or wellies. I imagine after the departure of the workmen and the arrival of blue skies and sunshine this site would be quite pretty. The first night brought rain but we sat snug as bugs in rugs with a small tipple listening to music, planning future trips for 2016. Early to bed, we always struggle with what we refer to as ‘jet lag’ on a Tuesday after working hard all weekend. During the night the rain continued drumming on the roof and the geese honked occasionally throughout the night. Well rested, we awoke to more rain and a very soggy site, at least the geese and ducks seemed happy waddling around in the puddles. After lunch we ventured into local Horsham for a nosey around. 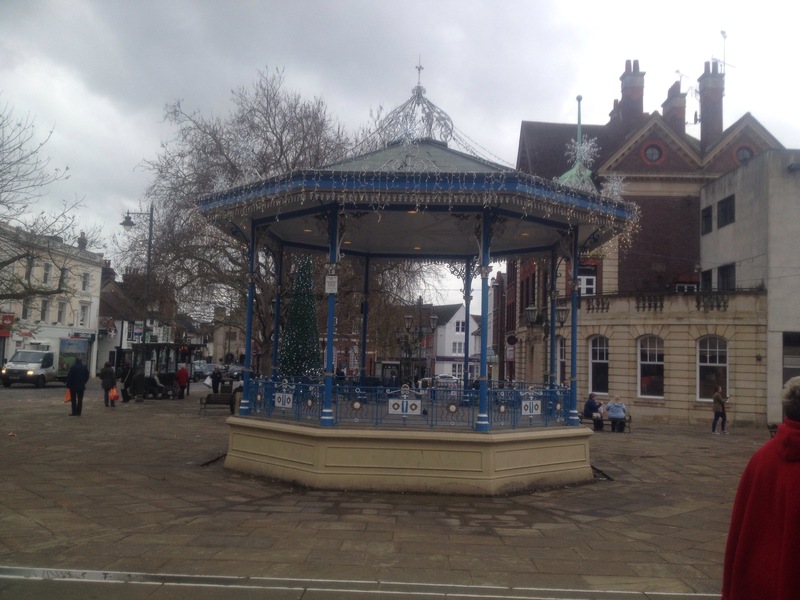 Described as a market town, very clean and modern boasting every shop you could need, sculptures and well placed landscaped seating areas which must be well used in the summer months. I love a town that provides adequate outdoor seating that isn’t just a bench plonked outside the local Greggs. We were a little too early in the day to appreciate the Christmas lights but the bandstand looked lovely decked in its festive lights. Back to the warmth of the Bailey as the dark clouds rolled in. Time for a read and a cup of tea. Getting to grips with the new ‘van. Still finding little things that aren’t as good as the Orion. The bathroom lacks the shelf space that we had in the shower and bathroom. Meaning shower gels and shampoo have to live on the floor in the shower. The loo roll holder is in an awkward place to reach too. With it being a side bathroom there isn’t a lot of standing room and leaning over the sink to wash your face if you are taller than 5 foot is a struggle. Saying that, we have a bed! Grumble over. A friend who lives close by came to visit. 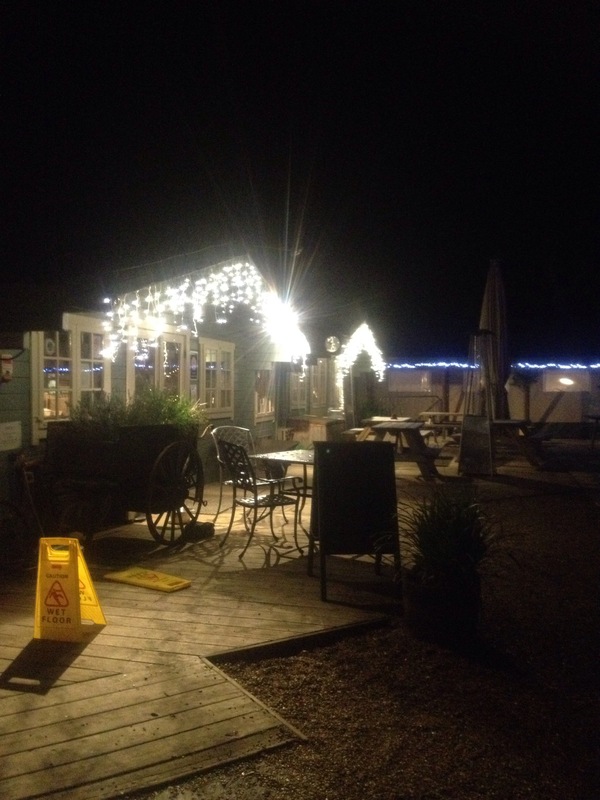 After showing off our new ‘van we had a wander over to the on site Cafe by the Lake which opens until 10.30pm most nights. A beautiful setting inside and out. We chose to sit in the safari tent which houses dining tables, comfy settees and two wood burning stoves. Local beer in hand we idled away an hour or so and put the world to rights. We awoke bright and early the following morning to no rain and the sound of ducks and geese. We toyed with the idea of going back to the Cafe on the Lake for a fry up but instead settled for cereal and toast and making an early start with the horrible process of packing up ready to go home. Waste tank empty, toilet empty, legs up and we notice activity by the nearby lake. After visiting the loo for one final time before leaving we thought we’d have a peek at what was going on. 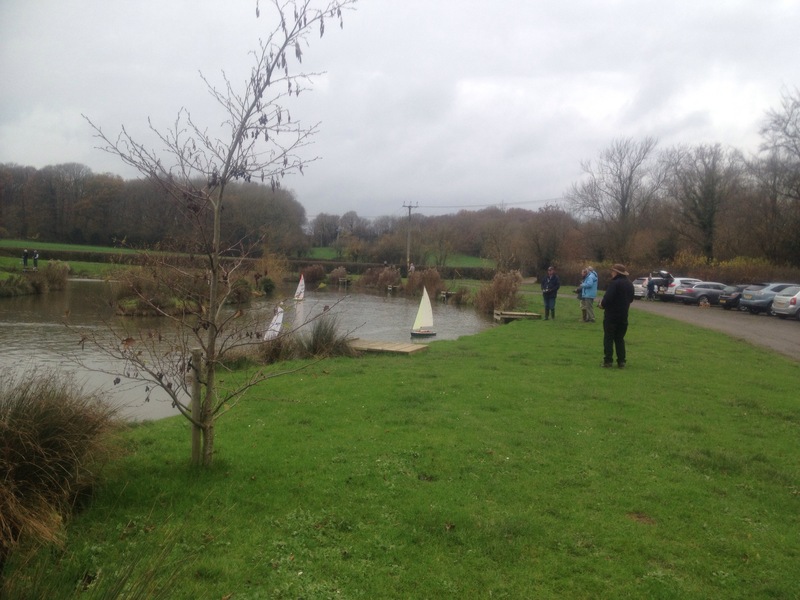 A group of model enthusiasts were sailing model yachts quietly around the lake, each to their own. Peaceful end to a lovely few days.